As the ranks of World War II veterans continue to dwindle in numbers toward their inevitable date with mortality, there is a renewed interest in the stories of the generation that put their lives on the line to save the world from tyranny. From December 7, 1941 to V-J Day, over 27,000 men and women from Berks County lived experiences that resulted in amazing tales of danger, intrigue, courage, survival and victory. For one young man who was destined to become a civic and political leader of Reading, Pennsylvania, December 7, 1941 was not the beginning of a monumental conflict, but a day of relief and thanksgiving because much needed assistance in the fight against Hitler was finally on the way. For Victor R.H. Yarnell 51, future Reading mayor, a gunner in the ranks of His Majestys Royal Artillery, the war was already over two years old and the outlook bleak. He had already experienced the horrors of war, was lucky to be alive, and the worst was yet to come. This is his unique story. Yarnell was born in Montreal, Canada on October 5, 1919 to an Irish father and an English mother. 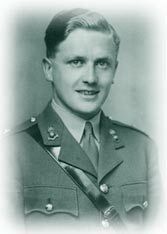 In 1938, after completing his studies at a Bedford, England boarding school the previous year, he joined the Bedfordshire Yeomanry (British Equivalent of the U.S. National Guard). A year later, World War II started with the German invasion of Poland. Following Great Britains entry into the conflict on September 3, 1939, Yarnell found himself on active duty headed for France. Although he was the only Canadian member of his artillery regiment, young Yarnell was following the proud military tradition of his family. His father had served in the famous Black Watch Infantry Regiment of the Scottish Highlanders during World War I, and two of his uncles whose names Yarnell bore (Victor Yarnell and Robert Hewlett) had paid the supreme sacrifice during that same conflict. On May 10, 1940, Germany launched a massive attack on France. Yarnells artillery unit, with its 1918 vintage guns designed for a different war in a different era, never had time to fire a shot. The French and British defenses, no match for the German Blitzkrieg, crumbled and began retreating toward the coast before the advancing onslaught. Yarnell and four comrades found themselves in the small French town of Saint Omer checking the contents of barges floating on a local canal for evidence of German troops. The evidence became overwhelming when they observed what looked like the entire German army entering the other end of town and heading their way. One step ahead of capture or death, Yarnell headed for the French coast and the port of Dunkirk. Forty miles of bad road lay between Yarnell and the beach where hundreds of thousands of Allied troops were trapped. With no room for him on a passing truck, an officer offered Yarnell the use of a motorcycle. He had never before ridden on a cycle, but the fast approaching enemy gave him the incentive to learn rather quickly. Man triumphed over machine and they arrived at Dunkirk on Sunday, May 26, 1940. For the next four days Yarnell hunkered down on the beach and waited. No food and little water, along with constant bombardment and strafing by German planes, made Dunkirk a living hell. But, unknown to most of the trapped men  British and French  at Dunkirk, there was a literal miracle underway. British naval vessels were coming to try to save the British Expeditionary Force. So, too, fortunately, was anything else that would float: fishing boats, private yachts, motorboats, and sailboats, heading for the beaches of Dunkirk. More than a few were skippered by women and children. Boats were also dispatched from elsewhere along the coast, including Holland. Finally, on May 30, Yarnells turn came to escape the carnage. He swam 100 yards to a Dutch fishing boat named Doggersbank, and 17 hours later, wet, cold, hungry, but alive, Yarnell arrived in Ramsgate, England. He had become one of 338,226 Allied soldiers to be rescued from the jaws of the Nazi Blitzkrieg. They would return. The returning survivors of Dunkirk were reorganized, housed in tents, and after two weeks of leave, assigned to coastal batteries where they dug in and waited for the German invasion across the English Channel. Fortunately, that attack never came. Yarnell spent over a year on Fort Spitsand, a 60-man garrison in the Spithead, the body of water between Portsmouth and the Isle of Wight where Yarnell served as a range finder for their only defensive weapon, a six-inch naval gun. It was while he was there that America entered the war. As the Allies began planning the future invasion of Europe, Yarnells future was taking shape as well. Following a tour of duty at what would become General Eisenhowers secret headquarters in Portsmouth, he volunteered to be a glider pilot, but was rejected because of his eyesight. However, he had tested well and was offered the opportunity to attend officers training school. In October 1943, Yarnell was commissioned a 2nd Lieutenant in the 86th Field Regiment. He would remain with this artillery unit, and after being promoted to 1st Lieutenant, return to France as part of the largest invasion force ever assembled. He would again struggle through the surf and sand of a French beach dodging hostile fire, but this time his destination was Germany, not England. This time the weapons he controlled were designed for their mission and he was trained in their use. This time would be no Dunkirk. The 86th Field Regt. hit Gold Beach on D-Day at H Hour plus 90 minutes in support of the 69 Brigade of the 50th Division of the British Infantry. The 86th consisted of three batteries of two troops each. Lt. Yarnell was the Troop Leader of F Troop, in charge of four mechanized vehicles called SPs (self-propelled field guns), each containing a 25-pound gun. The 86th approached the beach aboard their landing crafts (LCTs) that day with their 25 pounders blazing. 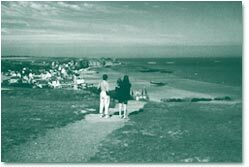 By the end of D-day, Yarnells guns were at Ver-sur-Mer, a village within a mile of the beach. By H plus 24 hours, the infantry they were supporting had established a beachhead eight miles inland and seven miles wide. In spite of slugging it out against increasing resistance from German Panzer units hidden in the bocage country where sunken roads and huge, thick hedgerows offered the enemy excellent concealment, the Allied forces continued to slowly advance. By August 20, 1944 the remaining German defenders in Normandy were surrounded in the Falaise Pocket, and either captured or killed. The battle for Normandy was over, but the war went on. The 86th Regiments next objective was Antwerp. Crossing the Seine River on August 28 at Vernon, they supported British units advancing through France and Belgium at a rapid pace. Yarnells unit crossed the bridge into Antwerp behind the 11th Armored Division on September 4. There was substantial German opposition in areas of the city and several days of heavy fighting were required to subdue the stubborn resistance. The job was made easier with the help of the Belgium resistance fighters. 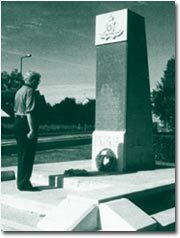 On September 9, the 86th left Antwerp to participate in Operation Market Garden, the huge airborne mission with the objective of capturing the bridge over the Rhine River at Arnhem with paratroopers, and then advancing a large army to link up with the airborne troops for the drive into Germany. Yarnells batteries supported the U.S. 82nd Airborne Division in this operation. Unfortunately, the objective failed and resulted in more casualties than the Normandy invasion more than three months earlier. This major battle was the subject of A Bridge Too Far, by Cornelius Ryan. Following Market Garden, Yarnells regiment was given a much needed rest, but by the middle of November, they were back in action again. In December, when Hitler mounted the massive counterattack into the Ardennes, beginning The Battle of the Bulge, the 86th was sent into combat in support of the British 30 Corps that engaged the Germans east of Dinant, the place where the Nazi counterattack sputtered and came to a halt. The fighting was so intense that on Christmas day, the traditional dinner had to be postponed until the action ceased. It wasnt held until three days later. Following the Ardennes action, the Allies began a steady advance into Germany and the end of the war. The Bulge had taken much of the fight out of the Germans. Yarnell crossed the Rhine at Rees on March 27, 1945, and by the time Germany surrendered on May 7, he was in the German North Sea port of Cuxhaven. After serving in the British Army of Occupation at Kiel until April 1946, Yarnell returned to England, was discharged, and then repatriated to his native Canada. His war had finally ended. Dunkirk, D-Day, Falaise Pocket, Arnhem, Battle of the Bulge; for over six years, Victor R.H. Yarnell had been a player on the stage of world history. He was an active participant in, and a survivor of, major events that shaped the 20th Century and will continue to influence our future for generations to come. His subsequent life achievements, impressive though they may be, pale by comparison. He immigrated to Reading in 1946. In 1949, he married Nancy Ahrens, a young lady whose rich Berks County heritage matched Victors British one. He became an American citizen in 1950, received a bachelors degree from Albright College in 1951, and a masters degree from The University of Pennsylvania in 1954. He taught government at Muhlenberg Township High School for 12 years. His public career included serving in the Pennsylvania House of Representatives from 1963-64. He served as Mayor of the City of Reading from 1968-72, and Director of the Schuylkill River Greenway Association from 1979-97. He was also deeply involved on the boards of the Reading Public library and the fledgling Berks County Public Library System. He still serves on the board of the Reading Area Community College (RACC). Today, the bespeckled, mild mannered, octogenarian with his distinctive sense of humor can be found in his favorite chair surrounded by mementos of his and his familys service to the Crown and humanity. In 1994, Yarnell returned to the beaches of Normandy for the 50th anniversary of the D-Day Invasion. In 1999, he again traveled to Normandy and the village of Ver-sur-Mer, liberated on the first day of the invasion. Ver-sur-Mer had invited veterans of the 50th Infantry Division to the dedication of a road named to honor their British liberators of so long ago. While there were 12,000 of them in 1994, only a dozen, including Yarnell, were able to attend the emotional ceremony 55 years later. Yes, time has taken its toll on those ranks of heroes, but their accomplishments and the spirit that drove them on to victory will never die if we document their stories for posterity. That Reading, Pennsylvania had a mayor who survived both Dunkirk and Normandy is a story unequalled by any other American city, and should be remembered as a proud event in our long and eventful history. Yarnell remembers his service with obvious pride, but also with humility and self-effacing humor. When asked what power or cunning he employed to escape countless close calls and survive numerous hair-raising experiences during the Dunkirk evacuation, he replied by quoting Thomas Gray, an 18th Century English poet, Where ignorance is bliss, tis folly to be wise. Indeed! And Reading and Berks County are blissfully fortunate to be able to call Victor Robert Hewlett Yarnell one of their own.  Barry L. Kauffman 77, of Leesport, retired last year as a machine tool distributor for his company, W.H. Jones Co., Inc. in West Chester. He continues to serve the company as a consultant. Kauffman is also a member of the Bern Township Zoning Hearing Board, superintendent of Alsace Cemetery, and executive director of the Society for the Preservation of Gruber Wagon Works. This article appeared in the Fall 2001 edition of the Historical Review of Berks County. It was reprinted with permission.